When in 1952 Pietro Germi brought to the screen one of the best-known French "pochades" of the Belle Epoque, LA PRESIDENTESSA (MME. LA PRESIDENTE), many people were shocked and perhaps even outraged. The Genoese director (1914-1975) had, in fact, made a name for himself with several films of vigorous dramatic impact and fervent social commitment, along the lines of a non-ideological Socialism of an humanitarian cast that enjoyed quite a tradition in Italy (think of the fiction of Edmondo De Amicis at the turn of the century). 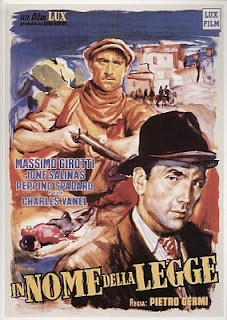 In 1949, IN NOME DELLA LEGGE (IN THE NAME OF THE LAW) had brought to the screen for the first time and with no holds barred the dangerous subject of the Mafia in Sicily; in 1952, IL CAMMINO DELLA SPERANZA (THE WAY OF HOPE) followed the journey of a group of poor people from the South towards the border to seek work abroad. A shy and private man, but actually, behind a screen of gruffness, warm in his affections, sympathetic to the poor and humble, prepared to fling himself courageously into the battles he felt were just, he created in films wonderfully human figures of workmen, of simple laborers, often played by himself. All at once in 1961, he changed genre and for the remaining years of his life became one of the foremost representatives of comedy. Actually, he had changed nothing but the accent. Germi was one of those directors who was concerned about communicating with the largest possible number of spectators. Comedy struck him at a certain moment as being more suited to that purpose, while maintaining the same human and social interests as before.